I never and I mean never get excited about nail polish launches but the news of Gwen Stefani teaming up with OPI may have tipped me over the edge. I'm not sure why I love Gwen Stefani but I do - everything she does is effortlessly cool, rocks red lipstick like no other and let's face it those ab's of hers are to die for. 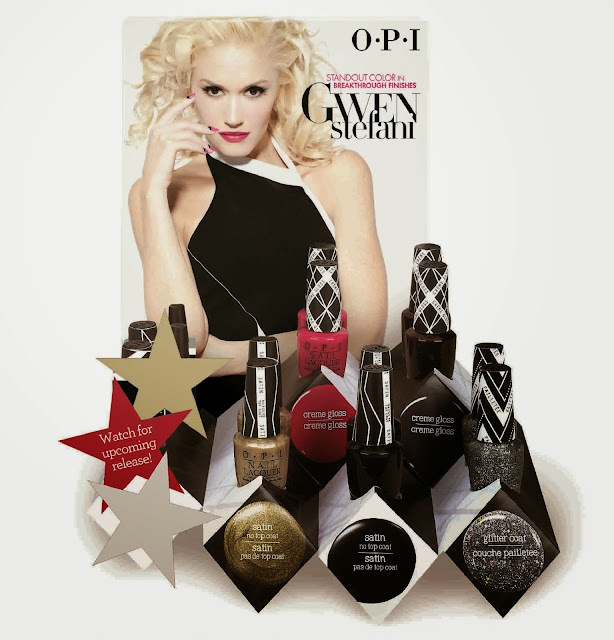 It goes without saying that as soon as the Gwen Stefani for OPI collection launches this coming January (2014) I will be purchasing a good few shades. All in there is six shades to choose from, one of which has been based on Gwen Stefani's signature red lipstick ( I wonder which red lipstick she prefers?) and the others are a mixture of brights, glitter and deep vampy shades all with varying formula's. The names are also a nod to Stefani...like you'd expect anything else! Truthfully there is something for most tastes and I do think this will be one of the few OPI collections that sells out in record time. Hey Baby (creme gloss) - "When it comes to pinks you're the "bright" one for me." I Sing in Color (creme gloss)- "The deep tones of this luscious blackberry hit all the right notes." Love.Angel.Music.Baby. (satin) - "This matte gold with satin sheen compliments all your passions." 4 in the Morning (satin) - "This dramatic black is a hit at after-parties." In True Stefani Fashion (glitter) - "Don't gotta be a hollerback girl to love this holographic silver glitter." Push and Shove - "TBA but I think it is red?" Are you as excited as I am for this collection to land? Probably the most excited I have ever been about a polish launch.. LOVE Gwen!! I'm liking that gold shade a lot! I can't wait for this!! I love the look of that snazzy gold colour!! I need! !